I flew out to Stanford last week for my annual pilgrimage to LDCX, a technology conference for cultural heritage organizations. I always take a few books to read during the flight. One of those was Goethe’s “Faust”, translated into English. I picked it up on a visit to my local library. I was curious, and wanted to go to a source to understand the “Faustian bargain.“ After all, D&D’s lawful evil devils adhere to contracts, and make deals with mortals. I can barely process what I read. The core theme of getting what you want at a later great cost shines. But there is so much more, drawing deep from Greek, Roman, Jewish, and Christian lore and style. The Chorus, Helen of Troy, a Homonculus, the Devil, the Holy Roman Empire, Griffons. When I hopped on the plane, I assumed I’d drift away from the story in favor of a nap or another more modern story. Instead, the story pulled me ever forward through pages of poetic verse, framed as a play. The characters describe and narrate the events of the story. A gross violation of the “show don’t tell” rule, but echoes the method of classical Greek theater. Yes, this was a difficult read. And yes, I most certainly didn’t grasp many of the nuances of the story; The numerous footnotes helped, but I feel that gaps remained. First, hubris is assuming one can out think the expert trickster. Mephistopheles deals in contracts, and won’t truly leave any loop holes. Second, the chase and the having are two different things. Both Gretchen and Helen are Faust’s obsession; In the case of Gretchen he wins her over yet abandons her when she commits infanticide. Helen leaves Faust when their son dies in an accident. Third, nature will win out. Hubris assumes otherwise. Engineering miracles will fail as nature is ever present and active. This is not something I’m likely to read again, though I most certainly see referencing this story in future endeavors. “Faust: A Tragedy” by Johann Wolfgang von Goethe by Jeremy Friesen is licensed under a Creative Commons Attribution-NonCommercial-NoDerivatives 4.0 International License. 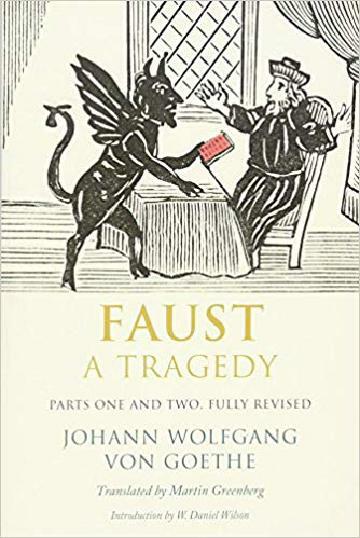 Based on a work at https://takeonrules.com/2019/03/30/faust-a-tragedy-by-johann-wolfgang-von-goethe/. Permissions beyond the scope of this license may be available at https://takeonrules.com/more_permissions/.